This unique retail and wholesale business serves a purpose by meeting the growing demands of portable power, alternative energy and consumer electronics. It's time to PanIQ! Owning a PanIQ Room provides you an opportunity to partner with an industry leader in a completely new sector of real life entertainment, whose sales grow more and more annually. Guaranteed Wal-Mart location. Super low rent. Units available throughout USA. Immediate financing available. Founded nearly 40 years ago, Papa Gino's Pizzeria is New England's premier Italian restaurant chain. We want our franchisees to succeed. The best way to do that is to accept the right people. The food business is a people business. Slight differences in quality can make dramatic differences! 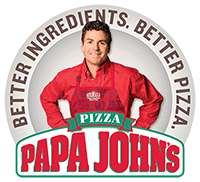 Papa Romano's Pizza & Mr. Pita have individual and co-brand opportunities with exclusive development areas available nationwide. The Party Franchise Ranked #1 by Entrepreneur Magazine in the Paper & Party Store category in their 21st Annual Franchise 500 Magazine! Parable Franchising can help you make a difference with a turnkey business plan for opening and operating a Christian retail store.